Posted on 1, September 2016 by EuropaWire PR Editors | This entry was posted in Education, Germany, Technology and tagged Mathias Pfeil, Technical University of Munich, TUM. Bookmark the permalink. MUNICH, 01-Sep-2016 — /EuropaWire/ — The Technical University of Munich (TUM) now counts yet another eminent member among its body of professors: Mathias Pfeil, General Conservator of the Bavarian State Office for Monument Conservation, has been appointed as an honorary professor. General Conservator Mathias Pfeil has been closely affiliated with the Technical University of Munich since his student years – this was where he trained as an architect. One additional important connection is the creation of the new professorship “Modern Monument Conservation”, which specializes in restorations. After his architectural studies at the TUM, Pfeil was the Regional Representative for Urban Development Promotion at the office of the Regierung von Schwaben (Government of Swabia). 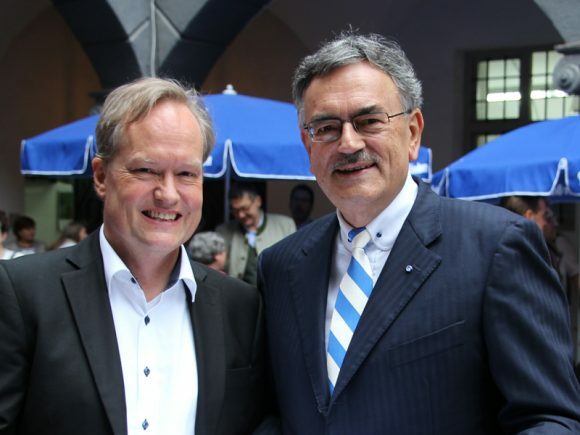 In 1994, he was elected to the Office of Urban Planning in the city of Waldkraiburg. In 1997, he transferred to the office of the Regierung von Oberbayern (Government of Upper Bavaria) where he once again worked as a Regional Representative for Urban Development Promotion. Then, in 1999, he transferred to the highest urban planning authority in the Bavarian Ministry of the Interior. In 2006, he took over as the head of the construction division of the Bavarian Department of State-Owned Palaces, Gardens and Lakes. Since March 2014, he has been the General Conservator of the Bavarian State Office for Monument Conservation. Taking advantage of the celebratory atmosphere at the summer festival of the Bavarian State Office for Monument Conservation, President Hermann took the opportunity to present Pfeil with his certificate and recognize his specialist expertise and international experience in the fields of architecture and monument conservation, which he will be contributing to the architectural courses at the TUM. As a member of the teaching staff, he will reinforce the core area of monument conservation, a field of training that is in high demand among students.